Hoy toca nuevamente inestabilidad acusada en el valle del Po, y en general en buena parte del norte de Italia. Todo ello sin despreciar lo que pueda suceder en puntos Austria, República Checa y Polonia, donde, aunque la humedad acompañará menos que en Italia, los potenciales convectivos son lo suficientemente importantes como para generar tormentas con corrientes ascendentes intensas, y por tanto granizadas localmente fuertes y algunos downbursts significativos. ¿Algún radar de la zona? Encontré este, parece de poca calidad comparado con los de aquí. Leí que murió una persona por causa directa de la tormenta. Movidita la cosa por Europa de este.Del Facebook de SWE. 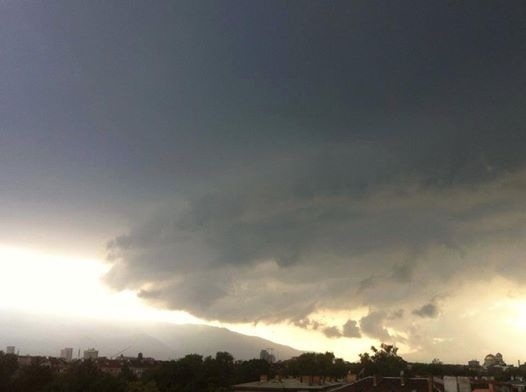 Llevan unos días que no paran en Europa del este, para hoy, de nuevo, un riesgo alto de eventos severos, pasando por supercélulas, tornados, pedregadas, multicélulas organizadas... con CAPEs y puntos de rocío bastante altos en grandes extensiones. A level 1 and level 2 were issued for Belarus and the Ukraine for severe wind gusts, large hail, excessive precipitation and to a lesser extent for tornadoes. A level 1 was issued for NE Poland, the Russian exclave of Kaliningrad and Lithuania mainly for excessive precipitation. A level 1 was issued for N Italy mainly for excessive precipitation and for the N Adriatic Sea mainly for waterpouts. A level 1 was issued for N Turkey for large hail and severe wind gusts. A level 1 was issued for a small area in N Norway and N Finland for large hail and to a lesser extent for severe wind gusts. A multi-core upper-level low still covers most of Europe. Three of its individual centers are situated over Denmark, the Gulf of Bothnia and the Westernmost Ukraine, respectively. A fourth one moves from Southern France into Central Italy. The whole complex connects with another extensive upper-level low near Iceland on Saturday, temporarily resulting in a broad trough with a strong negative tilt. Unsettled and cool to moderately warm conditions prevail in the entire range of this trough. Near the surface, the dominant cyclone slowly regresses northwestward from the Western Ukraine across Northeastern Poland towards the Baltic Sea. Ahead of it, a tongue of very warm air is advected into the Ukraine, Belarus and the Baltic states. High pressure brings mostly sunny and warmer-than-usual conditions into Iberia and into Scandinavia. Steep lapse rates from the Southeast overspread very moist low levels with dewpoints around 17°C in the warm sector of the cyclone. This will likely result in CAPE on the order of 1000 to 2000 J/kg on Saturday. Like usual under warm air advection regimes, the bulk of the thunderstorm activity will initiate rather late from the afternoon onwards. However, travelling vorticity maxima will then further facilitate convective initiation, and widespread storms are expected to form. Moderate deep-layer shear (around 15 m/s) and enhanced 0-3 km storm-relative helicity (100-200 m^2/s^2, locally up to 300 m^2/s^2) are sufficient for an organization into multi- and supercells which can bring the full spectrum of severe weather. The main risk changes from large hail in the storms' initial stages to severe wind gusts and excessive precipitation as soon as they merge into large clusters. A few tornadoes are possible especially towards the evening, when a beginning decoupling of the near-surface layers further enhances low-level wind shear, and in general in case of a favourable collision of outflow boundaries. A level 2 was issued for those parts of the Ukraine and Belarus where forecast models show consistent signals of large storm clusters which seem capable of producing longer swaths of severe wind gusts. In the large surrounding level 1 area, similar risks are expected but with a lower coverage. Towards the West (Poland, Kaliningrad, Lithuania), heavy precipitation will be the main hazard with the westward-moving storms while they gradually become elevated and start to weaken. Forecast models agree on at least moderate (>800 J/kg) but strongly capped CAPE over the Black Sea. Northeasterly sea breezes beneath moderate Southwesterly flow aloft create deep-layer shear on the order of 20 m/s. If a few storms manage to break the cap along the sea breeze front (aided by a short-wave trough aloft that crosses the region from West to East), they can turn well-organized with a risk of large hail and isolated severe downbursts. Like on Friday, moderate CAPE will form in response to diurnal heating and moisture accumulation in the vicinity of a long convergence zone which aligns with the Norwegian Alps and extends into Lapland and Karelia. Scattered afternoon storms are expected, most of them non-severe due to a lack of vertical wind shear. However, near the Northern rim of the unstable area, again a few better organized storms are possible as deep-layer shear rises to 15 m/s. Large hail and isolated severe wind gusts may occur. The slowly decaying upper-level low leaves a messy situation across much of the continent. Areas of augmented low-level moisture and daytime heating will result in the buildup of low to moderate CAPE. Scattered diurnally-driven storms are expected. With very weak vertical wind shear, lower CAPE than on the previous days and no pronounced convergence zone any more, most of this activity should be non-severe. Isolated instances of heavy downpours or marginally severe hail or wind events are not ruled out, but coverage should remain too low for a level 1. The only exception is the Northern Italian region, where increasing vorticity advection ahead of the French upper-level low will likely increase the coverage of storms and make them go on well into the night. Large, ill-organized clusters with a primary risk of heavy precipitation are expected. The center of the activity will move onto the Northern Adriatic Sea overnight and may spawn a few waterspouts. Da la sensación que pasa desapercibido, pero mirando muy cerca nuestro, ojo hoy a Francia, Benelux y Gran Bretaña, que tiene una pintaza para liarse un poco parda. Tienen una vaguada con borrasca puesta a huevo situada al oeste. A level 1 and level 2 were issued for England, France and BeNeLux for large hail, severe wind gusts, excessive precipitation and to a lesser extent for tornadoes. A level 1 was issued for E Spain for large hail and severe wind gusts. A level 1 was issued for the Switzerland mainly for large hail. Main feature is an Atlantic trough which slowly proceeds eastward over the British Isles and the Bay of Biscay. A mid-level jet streak rounds the tip of the trough over Spain and circles northward over France into England. In these regions, a 500 hPa flow between 20 and 30 m/s and travelling vorticity maxima set the stage for another day of organized convection. The main focus for convective initiation is provided by a wavy frontal zone, which separates a tongue of very hot air of African origin to the East from cool maritime air to the West. In the rest of Europe, warm and partly moist air is present under weak geopotential gradients. A diffuse, V-shaped upper-level low stretches from Southern Sweden via Western Russia into Turkey, while a highly amplified ridge extends from the Central Mediterranean across Central Europe and the North Sea to Northern Scandinavia. Remnants of nocturnal convection will likely affect Western and Northern France and especially England in the morning hours. Since these storms will mostly be elevated, the severe weather risk should temporarily be low, though some heavy rainfall may still extend into the current forecast period. Activity will move northward into Scotland and onto the North Sea while it gradually decays. Forecast models largely agree on clearing in the wake of these storms. With mostly sunny late morning and noon hours, a quick recovery of the air mass can be expected with CAPE values on the order of 1000 to 2000 J/kg (even higher per GFS) under deep-layer shear around 20 m/s. From the early afternoon onwards, more and more storms are forecast to initiate in the vicinity of the main frontal zone or along the mess of old outflow boundaries laid out by overnight's convection. They can quickly turn into multi- and supercells with a threat of large hail and severe wind gusts. Backbuilding and training activity may also easily produce a few flash floods, as the moisture content is exceptionally high (precipitable water around 40 mm). Of particular concern are areas of reduced vertical mixing, which allow a moisture accumulation and the maintenance of enhanced low-level shear and helicity. This can be expected along the sea breeze front in Northern France and Belgium, and in general in Eastern England, where warm air advection re-intensifies on the forward flank of a weak surface low which is forecast to track from Northwestern France (06 UTC) into Northern England (18 UTC). If diurnal heating and/or the lift impulse by outflow boundaries suffice to break the capping inversion in these regions, particularly well-organized supercells could spawn a few tornadoes, possibly even including a strong one. However, mesoscale developments need to be awaited before the degree of this threat can further be specified. Despite remaining uncertainties due to downstream effects of overnight's vigorous storms, a level 2 seems to be warranted. Further South, the main frontal zone will slowly move eastward as a diffuse cold front. Large-scale lift ahead of the trough axis, weak cold air advection at 850 hPa and strong diurnal heating of near-surface air will erode the strong cap, and convective initiation becomes more likely than on Friday. Depending on the qualitiy of low-level moisture which may be mixed out in some places, 500-1500 J/kg of CAPE seem realistic. Deep-layer shear increases from 20 m/s over Central France to 35 m/s and beyond over parts of Spain. At least scattered storms are expected to form from the early afternoon onwards in a belt across France. In Eastern Spain, activity will be more isolated and tied to orographic features, as the maritime moisture will likely be diluted before it can move too far onshore. The French storms will organize into multicells, supercells and short bowing lines while moving NNE-ward. Large hail (especially in the early stages) and severe downbursts are the primary risks, and even isolated extreme events (hailstones larger than 5 cm and wind gusts stronger than 32 m/s) are possible. The motion of these storms almost parallel to the frontal zone seems detrimental to the development of a larger bow echo but enhances the risk of excessive precipitation especially towards evening, when one or several large MCSes may crystallize. Activity will move into BeNeLux and possibly Westernmost Germany overnight while it gradually becomes elevated. The main focus of severe weather should then shift to Southernmost France, where a weak cyclogenesis over the Gulf of Perpignan will promote further storms with a possibility of all kinds of severe weather all night long. This includes in particular a risk of flash floods along the Southeastern rim of the Massif Central, which experiences sustained strong upslope flow. Scattered thundery showers will form in the well-mixed to slightly unstable postfrontal air mass. Towards the South, storms may still benefit from deep-layer shear up to 20 m/s beneath the departing jet streak. Marginally severe hail or wind events are not ruled out, but the risk seems to be too low for a level 1. Mostly diurnally-driven storms are forecast. With low to moderate CAPE and weak vertical wind shear, severe weather is unlikely, though isolated large hail and heavy rainfall events are possible. The hail risk seems to be somewhat enhanced over Switzerland, where afternoon storms over the Alps and the Jura mountains can benefit from increasing vertical wind shear as the French jet approaches. Un extracto a corto plazo de previsión con algunas condiciones muy favorables para convección profunda, extensa y organizada, sacado de lightningwizard.com, previsto para hoy a las 17:00 hora local (abajo del todo). Pero habrá que estar atento también a la evolución de la noche próxima que, probablemente, puede ser movida. Y mañana también lo tendrán. Ya le eche el ojo hace 2 o 3 dias a esta situacion por si me escapaba!